GlyS3 matches any substructure such as glycan determinants to a large collection of structures recorded in GlyConnect and SugarBindDB. The search is performed using RDF technology specifically designed for querying and storing glycan structures. 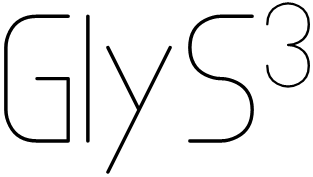 GlyS3 provides the user with a graphical interface which can be used for drawing glycan structures. A text interface is available and accepts only structures encoded in GlycoCT condensed format. The graphical interface, called GlycanBuilder, was not developed and is not maintained by the Swiss Institute of Bioinformatics. Property Graph vs RDF Triple Store: A Comparison on Glycan Substructure Search. Alocci D, Mariethoz J, Horlacher O et al. The GlycanBuilder and GlycoWorkbench glycoinformatics tools: updates and new developments. Damerell D, Ceroni A, Maass K et al.